Jess: Are you going to ride with me on Wednesday? Me: Yes, but I don’t want it to take all day. I don’t know what I was smoking, since that’s the only kind of ride we do. But we are discovering lots of amazing new (to us) routes. 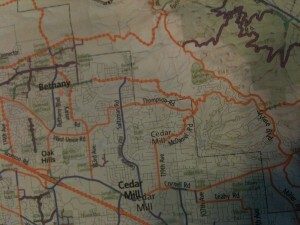 Yesterday we went over the west hills, down the back side of NW Thompson and out into the great suburban beyond. “Because we weren’t willing to climb,” she said. 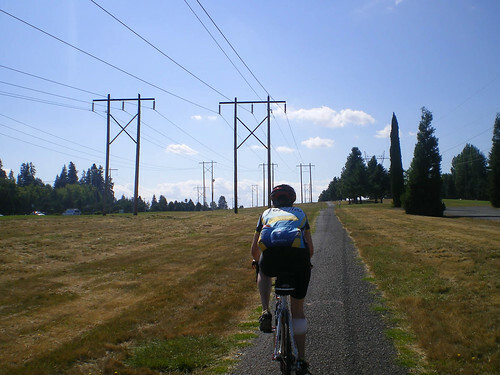 Thank goodness for Cycle Oregon, which is forcing us to seek out hills so we’ll be able to survive our vacation. We rode into the little town of Bethany, which I’d never heard of before yesterday, and onto the path in Springville Meadows Park. 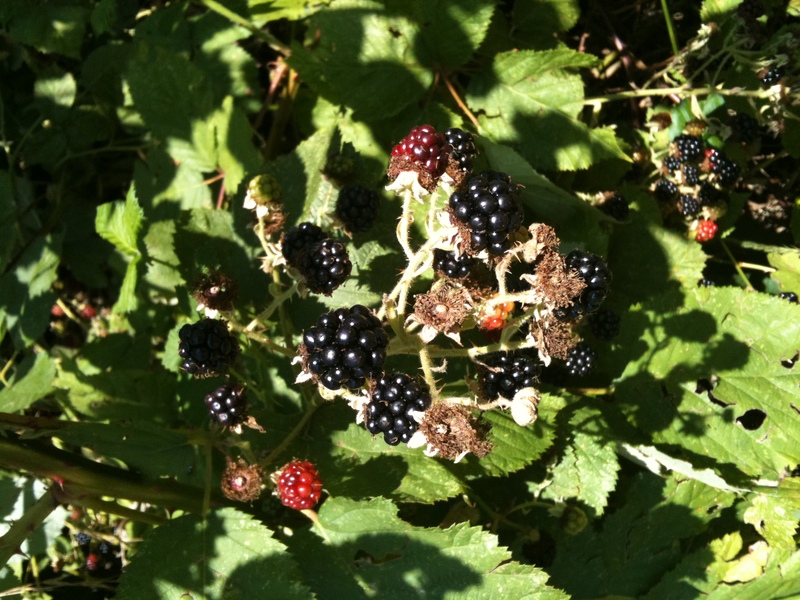 We rode along until a gust of wind overwhelmed us with the scent of ripe blackberries, at which time we pulled over to seek out the source and have a snack. We followed the path to Rock Creek. 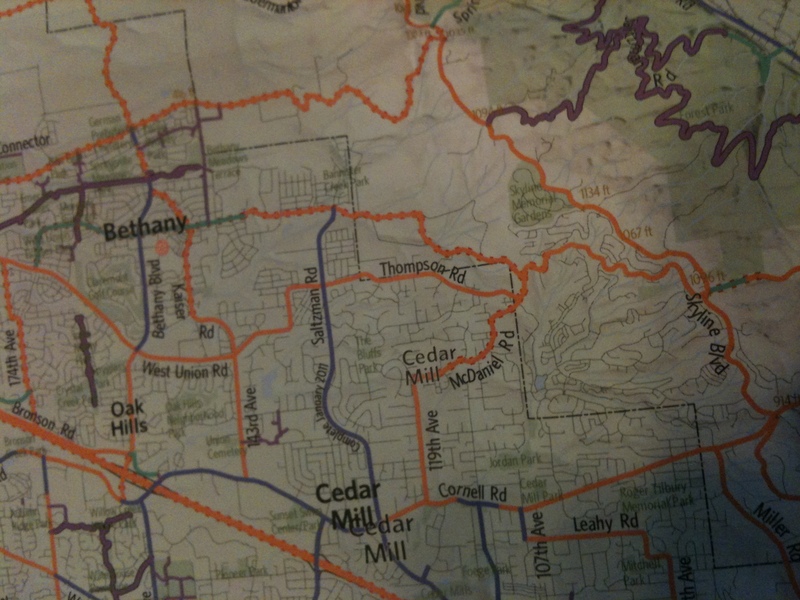 Then just for variety, we followed quiet neighborhood street Rock Creek Blvd to 185th, crossed over highway 26, and looped back on Cornel Rd (nice wide bike lane) and 143rd Ave (non-existent shoulder 🙁 ) before climbing back up Thompson. Note to self: No more rides that end with coming back through town during rush hour on a weekday. Just to top it all off with a cherry, we stopped by Metropolis Cycle Repair to pick up my newly tuned up Big Dummy. New chain(s) (it takes 4 or so to do the job), new cassette and I’m pretty sure the mechanic spit shined my frame with his own drool. I strapped the roadie on the back and pedaled home. Jess was kind enough to slow down and wait for me now that I was riding for two.